A father-and-son story written into the pages of football folklore, it can be argued that no family has had more influence on a sport than the Mannings. Archie – the patriarch - a star quarterback at the University of Mississippi and then with the New Orleans Saints, followed by oldest son Cooper, whose football dreams were cut short by a spinal condition, then sons Peyton and Eli – both of them quarterbacks, All-SEC, number one draft picks, back-to-back Super Bowl champions and MVPs. 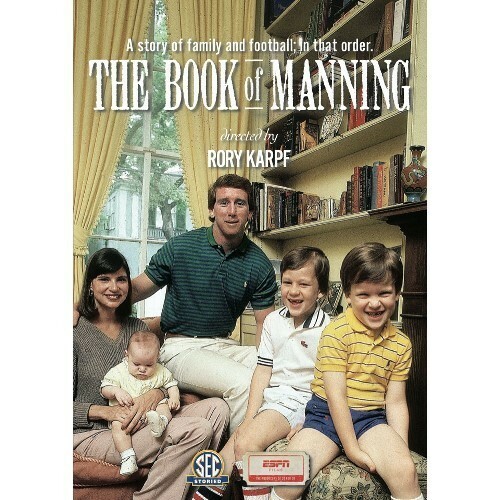 Narrated by actor John Goodman, The Book of Manning features revealing interviews with Archie, Olivia, Cooper, Peyton and Eli Manning along with other family members, friends, former teammates and coaches as well as never-before-seen photos and home movie footage of Archie and his sons. Through it all, director Rory Karpf explores how a tragedy shaped the course of not only Archie’s life, but his family’s as well.